turn this junction back into a motorway. With thanks to CycleofFutility blog for keeping up to date on this. According to CycleofFutility, Val Shawcross is saying that the entire Blackfriars northern junction plan has been put back into consultation. And a consultation period will be announced shortly. Just to remind ourselves that this scheme was sent round to interested parties last Friday. And that the consultation was for only one tiny bit of new cycle lane, with responses needed within 72 working hours. Democracy working at its best. It really is time to keep the pressure mounting on this junction. What's not clear, though, is what is actually going on. At our meeting with the City of London and TfL on Tuesday, we were told by one politician that Transport for London had railroaded this scheme in fairly last-minute after circulating an original scheme which the City had approved. Whether that's true or not, we can't tell. But it's clear that there's some discord going on. But we were also told that the entire scheme had been signed and sealed several months ago, possibly as much as a year ago. So how come TfL is suddenly opening up a last-minute consultation on what is, after all, not an insignificant piece of work? I'm yet to post my own letter to our London Assembly members but will be doing so over the weekend, now that I know I have time to respond in a more considered manner. In any case, thank you to the dozens of you who have cc'd cyclistsinthecity on your correspondence so far. And thank you to Londonist and to the Guardian for highlighting this insanity after we first flagged it here on Friday night. Great news if true. But did you see this on Ross Lydall's blog? "There are two schemes - a massive change to the northern road junctions that is being done by Network Rail to tie-in with the redevelopment of Blackfriars station. It says this work was authorised some years ago in a Transport and Works Act. Network Rail said in a statement today: “The proposed road layout will deliver better, safer and more convenient access to the redeveloped station’s new common entrance. The other thing that is happening to the area is that TfL is proposing to install a cycle lane across an existing traffic island. 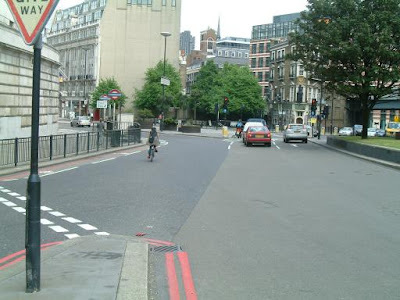 The effect of this would be to allow cyclists heading east up the Embankment slip-road to follow a path to the sothbound crossing of the bridge - which is likely to be of use to a minority of riders." It would be good to ascertain exactly what TfL are now extending the consultation on. If it's just the right-hand turn, then that's not much use to us. But whatever happens, you have done brilliantly to get such coverage and response to this issue. Jim,yes, it's a whole confusing issue. I've tried to clarify our understanding in the last couple of blog posts but for now I'm relying on the responses people are getting from Val Shawcross. Just a thought, but can we hire a road planner from The Netherlands/Denmark to come up with a proper plan for Blackfriars Bridge that benefits walking and cycling? I know it's not our job to do this, but it's obvious that TfL don't get it - yet! Perhaps we could hand out real blue-prints to show them what we mean by Dutch-style/Copenhagenized infrastructure. Anyone got any spare cash or know anyone who would be willing to do it for free?